Girls Youth Tent Loft Bed by Coaster Furniture. 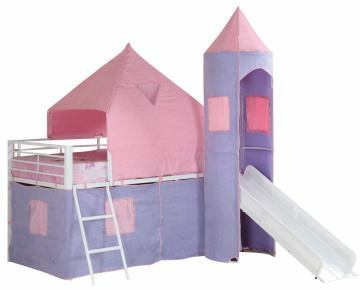 This exciting castle styled bed with an included slide is the dream space for any little girls room. This bed is constructed with metal finished in a gloss white and pink, purple and white fabric is included. With storage space underneath the bed your child can keep everything within close reach. Bring fun and excitement into your child's bedroom with this bed!